Freyja, (Old Norse: “Lady”), or the Frowe is most renowned of the Norse goddesses, who was the sister and female counterpart of Freyr with great prowess over seiðr-craft and especially sexual love, fertility, battle but possibly even death. Her father was Njörd, the sea god. Pigs were sacred to her, and she rode a boar with golden bristles. A chariot drawn by cats was another of her vehicles. There remains debate on Freyja’s privilege to choose one-half of the heroes slain in battle for her great hall in the Fólkvangar (the god Odin took the other half to Valhalla). She possessed a famous necklace called Brísingamen (torc or necklace), which the trickster god Loki stole and Heimdall, the gods’ watchman, recovered. Greedy and lascivious, Freyja was also credited with the evil act of teaching witchcraft to the Aesir. Freyja (ON meaning Lady) As the mistress of magic and goddess of sexual love, Freyja is the owner of Brísingamen (possibly a torc or necklace) which Loki alleges in Lokesenna that she slept with four dwarfs in order to possess it, rides a chariot pulled by two cats, keeps the boar Hildisvíni by her side, possesses a cloak of falcon feathers, and, by her husband Óðr, is the mother of two daughters, Hnoss and Gersemi. 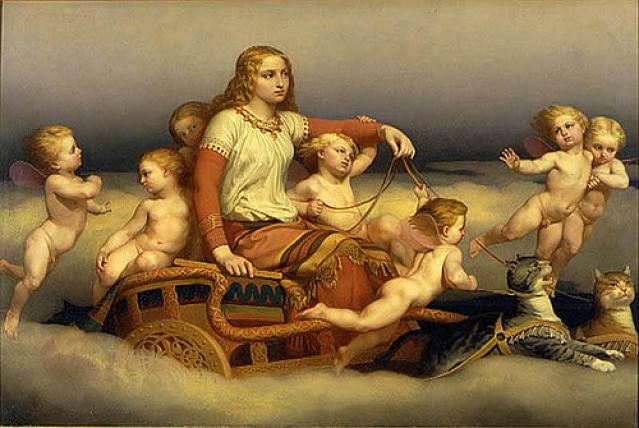 Freyja is attested as having nine additional names; Gefn, Hörn, Mardöll, Skjálf, Sýr, Thröng, Thrungva, Valfreyja, and Vanadís. Along with her brother Freyr ON "Lord", her father Njörðr, and her mother (Njörðr's sister, unnamed in sources), she is a member of the Vanir. 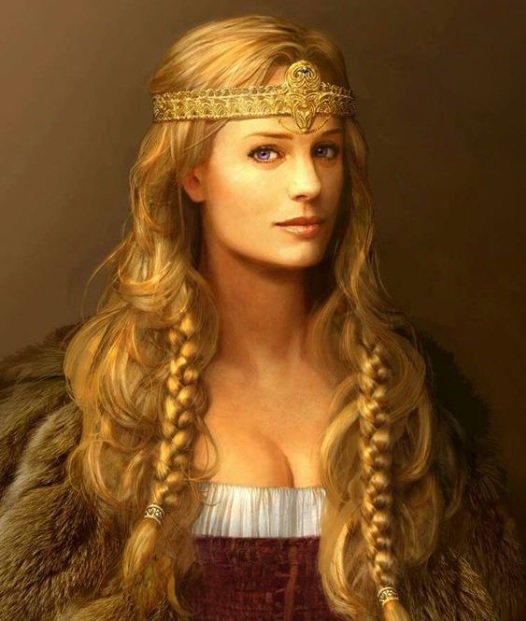 Stemming from Old Norse Freyja, modern forms of the name include Freya, Freija, Frejya, Freyia, Fröja, Frøya, Frøjya, Freia, Freja, Frua and Freiya. If you wish to gain her attention write her a love poem or song. Her two cats are not your household pussycats but rather Norwegian Forest Cat, wild and ferrule. This off course in in contrast to the Norse goddess Frigga, also a formidable sorceress who appears at the onset wholesome and safe but this is not entirely correct. Fryer austan Vanakvísl í Asía var kallat Asíaland eða Asíaheimr, en þat fólk var kallat Æsir, er þar byggðu, en höfuðborgina kölluðu þeir Ásgarð. Óðinn var þar nefndr konungr yfir. Þar var blótstaðr mikill. Njörð ok Frey setti Óðinn blótgoða. Dóttir Njarðar hét Freyja. Hún fylgdi Óðni ok var friðla hans. Menn þeir váru í Asía, er einn hét Álfrigg, annarr Dvalinn, þriði Berlingr, fjórði Grérr. Þeir áttu heima skammt frá höll konungs. Þeir váru menn svá hagir, at þeir lögðu á allt gerva hönd. Þess háttar menn, sem þeir váru, kölluðu menn dverga. Þeir byggðu einn stein. Þeir blönduðust þá meir við mannfólk en nú. To the East of Vanakvisl in Asia was a country called Asialand or Asiaheim.Its inhabitants were called Æsir and the chief city they called Asgarth.Othin was the name of their King, and it was a great place for heathen sacrifices.Othin appointed Njörth and Frey as priests. 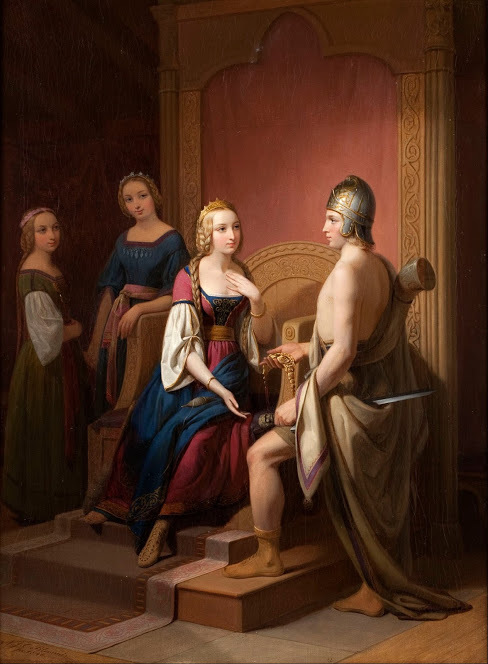 Njörth had a daughter called Freyja who accompanied Othin and was his mistress. There were four men in Asia called Alfregg,Dvalin, Berling and Grer, who dwelt not far from the King's hall, andwho were so clever that they could turn their hands to anything. Men of this kind were called dwarfs. They dwelt in a rock, but at that time they mixed more with men than they do now. The Sörla þáttr is a short story in the later and extended version of the Saga of Olaf Tryggvason in the manuscript of the Flateyjarbók, which was written and compiled by two Christian priests, Jon Thordson and Magnus Thorhalson, in the late 14th century.Freyja's most famous and referred to affectation is her necklace Brisingamen although it's exact design and meaning have been debated for generations. It has been suggested that the Elder Norse goddess Freyja is a goddess of love or perhaps even the family. Other suggestions are that Freyja is a war goddess somewhat like the all-father Othinn. It is my contention that the Vanic goddess sexual prowess and mind bending abilities in seiδr makes her both a war goddess and a potent sorceress with great sexual abilities to win over the hearts/minds of men and gods alike. Freyja wields dark magic rather than cold steel but she certainly is not the goddess of love. The Nordic goddess Freyja is also known by nine other additional names: Gefn, Hörn, Mardöll, Skjálf, Sýr, Thröng, Thrungva, Valfreyja, and Vanadís. Of all those names, Vanadis or the dís of the Vanir appeals to me the most in part because of its connection with newborn children, the vans but especially the fate they have to live out during their lifetime. Dis it has been argued may also refer to early Scandinavian fertility goddesses, personal guardians, but also warrior-goddessesThe term dís has been regarded as cognate with Old High German itis, Old Saxon idis and the Anglo-Saxon ides, all meaning "lady. So could it just be that Vanadis simply refers to Lady of the dísir? The disir on the other hand were quite possibly the ancestral spirits of dead women? "I thought dead women came hither into the hall ,not poorly decked out.They wished to choose you,would've invited you quickly to their benches;I declare of no value these dísir to you." En Freyja er ágætust af ásynjum. Hon á þann bæ á himni, er Fólkvangr heitir. Ok hvar sem hon ríðr til vígs, þá á hon hálfan val, en hálfan Óðinn, svá sem hér segir: Freyja is the most famous of the goddesses. She has in heaven a dwelling which is called Fólkvangr, and when she rides to the battle, one half of the slain belong to her, and the other half to Óðinn. en þar Freyja ræðr And there rules Freyja. en halfan Óðinn á. The other half is Óðinn's. 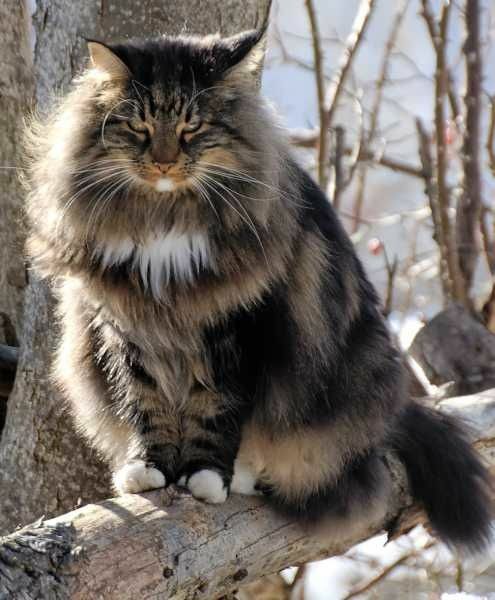 The Vikings believed that Freyja rode a cart drawn by a team of cats but these cats were not your domestic pussycat but rather Norwegian Forest Cats. 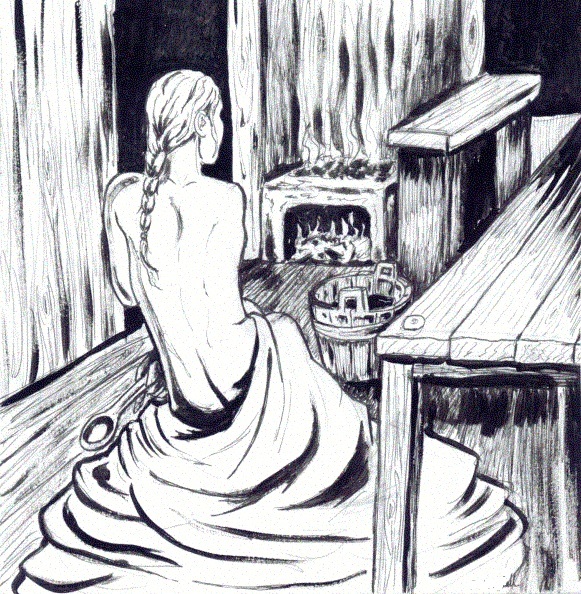 There is a considerable amount of sexual imagery connected with seiðr and its performance. Tolley (1995a:70) effectively makes the point that none of this should surprise us, due to the general climate of "sexual anarchy" that attaches to the Vanir deities throughout the Old Norse Myth cycle. The prime example of this is naturally Freyja, the original mistress of seiðr, who was it seems notorious even amongst the gods for her incestuous relationships and liaisons with a range of beings. Her sexuality is discussed by Boyer (1995:49-57) and Nasstrom (1995:65ff, 104-10) Margeret Clunies Ross (1994:209) in her book Prolonged Echos argues on the penetrative aspects of seiðr, that we can see the act of spirit possession in terms of a woman allowing herself to be entered.....possibly by a spirit or a god. I can further add that this might extend to some form of sexual ritual enactment but this is pure speculation. Of note is that wooden phallus have been found in the Schleswig Holstein dating back to the Viking Age. Jung believed that there were certain basic mental patterns, or "archetypes" as he called them – patterns of information that exist in all human minds and that are part of the heritage of the human race. He thought that the contact of the conscious mind with these patterns, or the intrusion of the patterns into our consciousness, gave rise to the mythologies and religions of the world. Jung did not believe that those beings were literally real! It’s perfectly clear from Jung’s writings that he analysed the concept of God and the various concepts from mythology in terms of the functioning of the human mind – specifically, the unconscious mind. Jung’s concept of God and the gods was psychological. I don't think there's anything in that concept that requires belief in the supernatural. Jung was interested in so-called paranormal phenomena. Jung, along with the noted physicist Wolfgang Pauli, developed the concept of “synchronicity,” which was meant to interpret or explain certain coincidences that people sometimes label as “paranormal.” However, there is no reason to think that synchronicity, if it existed, would be supernatural. Synchronicity was what we today would call a naturalistic explanation of so-called paranormal phenomena. It was meant to bring seemingly paranormal events into the framework of nature. No matter what you think of the idea of synchronicity, that idea is NOT evidence that Jung believed in the supernatural. Quite to the contrary – it shows that he was looking for lawful explanations of odd phenomena This is true whether the hypothesis of synchronicity is right or dead wrong – and whether or not the phenomena Jung was trying to explain had other explanations. Neo-pagans today have the luxury of possessing some form of mass communications device with electronic instant information via cell phones, personal computers and the internet. They also have access to major libraries that stores the knowledge from multiple cultures. This insight and intellectual wisdom has allowed moderns to see similarities in common traits between cultural deities. What we tend to forget also that it is a miscalculation to make assessments of history using modern day Judeo Christian politically correct values. However, scholars and academics in Norse Mythology do not use Comparative Mythology, Jung's Archetypal analogies or Unverified Personal Gnosis as a basis to discuss Old Norse Religion. Comparative mythology generally works by conflating material gathered from many questionable sources in an ad hoc manner, without verifiable or conclusive evidence as to why one should assume that two seemingly separate things should be seen as the same. There is a major flaw in logical thinking here and such comparative mythological approaches are usually generated by those posing under the guise of pseudo-scholarship that refutes the burden of evidence but prefers broad speculation on psychological theories or comparative mythology mainly on Asatru 101 e-forums. There are too many wild leaps of faith using this very flawed methodology that strings together many loose threads of unconnected ideas into a seemingly plausible theory. The gods/goddesses are not some sort of estranged beings if we bother to take the time out to get to know them, and honour them. Simply viewing the Gods as archetypes seems shallow and cold, yet to see the Gods as individuals warrants more study than to revere a generic force as an aspect of other beings. The Gods should be researched, studied and met as individuals and not generic versions of other gods from Egypt, India or Greece! Consider also the great deal of discernment between deities over any given landscape. It requires a great deal of faith to perceive a deity as separate from another. It denies most of our intellectual minds, since it seems more logical to subscribe to something such as Jung's psychological theories. There remains a considerable amount of sexual imagery connected with seiðr and its performance. Tolley (1995a:70) effectively makes the point that none of this should surprise us, due to the general climate of "sexual anarchy" that attaches to the Vanir deities throughout the Old Norse Myth cycle. The prime example of this is naturally Freyja, the original mistress of seiðr, who was it seems notorious even amongst the gods for her incestuous relationships and liaisons with a range of beings. Hér megið sjá heldur rösklegan …. vingul skorinn af viggs föður …. is not at all dull between your thighs. The Prose Edda and Heimskringla, written in the 13th century by Snorri Sturluson, both describe Óðr as Freya's husband and father of her daughter Hnoss. Heimskringla adds that the couple produced another daughter, Gersemi. It is said that they were so beautiful that their names were used for "our most precious possessions" (both of their names literally mean "jewel"). I strongly believe that it is important to remember Freya's daughters Hnoss and Gersemi in your devotions to Freya because Freya told me so herself and she also intimated that she wanted the inhouse fuedings between her folkway to stop. My first encounter with the goddess Freya was via her two game cats who were clawing at my testicles and this scared the crap out of me as it was spontaneous and unplanned. My face off with Frigga also unplanned was in full blow Nordic regal blue and white dress, torioiseshells with braided hair and looking very regal. At that time in my life, we were collectively experimenting with opening portals into their world. It takes a lot of patience, perseverance and dedication to do this. The gods, goddesses are real, not aspects of somebodys imagination or what you hear from others. They walk this world just as we do. Lastly she never spoke in modern English, only the old tongues which I suspect is proto norse. The abilty to see the unseen is a lifelong skill. Some find it easier than others to do so. You will need to find yourself a trained seer and get her to teach you just as I did. My original encounters with Freya was during trance possession work of others but the beautiful goddess also speaks directly to me when it suits her. You cannot force communications with the Tivar, only facilitate the meeting when it happens which is more than ever spontaneous. Important The reason I suspect that the Nordic gods, goddesses are not as effective in aiding us is that the folks who follow the Tivar today are so stuck up their own monotheistic beliefs in that all powerful all seeing god that they actually buy into the misconception that Norse gods, goddesses do not need devotions. They do! It is my further expressed opinion that unless this changes, the Norse gods and goddesses will not be at their full capacity in wyrd changing prowess to help all who seek their help. Gullveig vs Freyja is a age old argument that still persists on Asatru forums mainly perpetuated by the lesser read. They are not the same! The current scholarship disagrees with your findings and arguments thus far. For the record consider: As I recollect what National Romanticist Victor Rydberg suggested was: It can, in fact, be demonstrated that Aurboda is identical with Gulveig-Heid. The evidence is given below in two divisions: (a) Evidence that Gullveig-Heid is identical with Angerboda, "the ancient one in the Ironwood"; (b) evidence that Gullveig-Heid-Angerboda is identical with Aurboda, Gerd's mother. These stanzas are obscure, but it is hardly going too far to say that Gullveig came to the hall of Odin (Har), was attacked but could not be killed, and under the name Heid went about performing seiðr. Since Ynglinga Saga says that Freyja first brought seiðr to the Ǽsir, it is not impossible that Gullveig is not Freyja"
It is fairly obvious that the narratives in Vǫluspá and Baldr's draumar resemble these two patterns in some respects, but that they do not altogether fit into them. In Vǫluspá stanza's 22 we encounter another Vǫlva called Heiðr, who is usually supposed to be a transformation of a figure called Gullveig (apparently one of the Vanir). I feel strongly this is a mistaken interpretation, and that Heiðr is more probably the narrating Vǫlva of the poem. The name also appears at the end of Hyndluljóð 32, among a list of giants of both sexes, where it is immediately followed by a line about the mythological ancestry of völur. This poem (or at least this section of it) is referred to by Snorri as Vǫluspá in skamma, and it shows clear textual echoes of the longer Vǫluspá; for its poet, Heiðr was clearly a giantess (like the narrating Vǫlva of Vǫluspá) whose name prompted a line about völur in general. Whether we give the narrator of Vǫluspá a name or not, she was brought up (or brought forth) by giants and remembers nine worlds (stanza's 2) - probably the nine worlds of the dead, into which human beings die out of Hel, According to Vafþrúðnismál 43. She is paid for her prophecy with hringa ok men (st. 29). Her magic is performed in a trance (leikin, st. 22) and her prophecy is delivered in vatic fornyðislag verse to a patriarchal figure, in this case Óðinn; it represents a truth which she `sees' (the verb is also used by the völur called Heiðr in Hrólfs saga and Örvar Odds saga), and one of her refrains - vitu› ér enn, e›a hvat? - is echoed several times by the giantess Heiðr in Hyndluljóð (viltu ennlengra? )50 and once by the enchantress Busla in Bósa saga (e›a viltu flulu lengri?). The patriarch has three sons (by different mothers, so that they are half-brothers to each other) who figure in a central episode of the action (the killing of Balδr and the revenge for it). 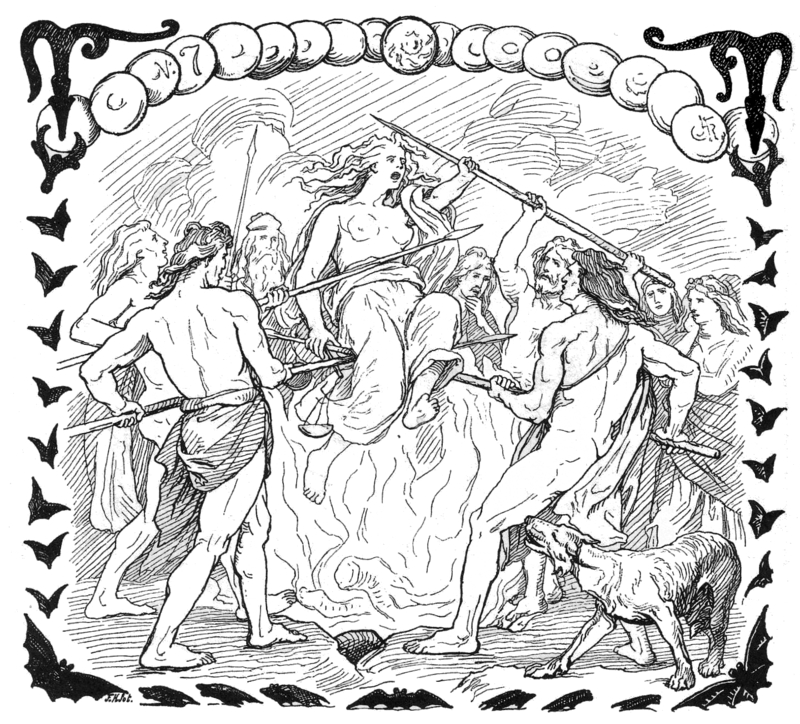 The Vǫlva's prophecy includes the death of the patriarch figure (though not at the hands of his sons), and fire is involved, although it is not the actual cause of his death. a wounding (Fóstbræðra saga 9-10) or a killing (Fóstbræðra saga 23); reciting a poem to give him a fair wind (Fóstbræðra saga 10); healing his wounds (Fóstbræðra saga 23, Hauks fláttr); travelling with gandar in her sleep in order to discover a danger threatening him (Fóstbræðra saga 23); supplying him with a magic weapon (Hauksfláttr); raising up a dead man to discover the future (Saxo). Ynglinga saga ch. 13 (and Ynglingatal 3, narrative verse, fornyrðislag). 43 ed. Finnur Jónsson, 20-1; Flateyjarbók I, 81-2. Turville-Petre's suggested identification of Gullveigr with Freyja was based on Dumezil, whose eagerness to force all of Norse mythology to fit into his tri-functional model has been rapidly losing support over the past couple of decades. For a good review and critique of this and other theories, see the entry for Gullveig in Rudolf Simek's "Dictionary of Northern Mythology," pp. 123-24. A novel theory which I find intuitively appealing was advanced by Lotte Motz in her 1993 article, Gullveig's Ordeal: A New Interpretation," ANF vol. 108, pp. 80-92. Based mainly on etymological clues, Lotte Motz hypothesized that the reference to Gullveig's repeated deaths in Vǫluspa was an early form of the "John Barleycorn" folk motif - and Gullveigr is a personification of the golden mead of the gods. No relation to Freyja. Hel no! Müllenhoff, and modern scholars like Gabriel Turville-Petre suggested that Gullveig is also a name for the goddess Freyja. In my view, sadly, this myth has been passed around internet forums for decades but here follows a learned opinion. Since Snorri says that Freyja brought seiðr to the Ǽsir, many scholars have assumed that Gullveig/Heid is actually Freyja, one of the Vanir, and that her corruption of the Æsir precipitated the war. The stanzas sequences in Vǫluspá 21-24 are IMO anything but clear? The suggestions however may lead to a false conclusion that a character called Gullveig or possibly Heid entered the arena on what was war on folk/ people/ army.... the descriptions vary depending on whose take you happen to support. We also must remember that Snorri's ultimate goal was to preserve the "prose" and not the lore actual and there is a subtle difference. It seems to me that both linguist, scholars and enthusiasts have all fallen into the trap of assuming Snorri preserved the lore he did not! Snorri preserved prose. And we all know that prose is very open to broad interpretation and has no real historical time line. It is by far much more likely that these events were totally separate incidents over a vast expanse of time centuries perhaps that was fused together into fragmentary prose to make poetic sense. Turville-Petre's suggested identification of Gullveigr with Freyja was based on Dumezil, whose eagerness to force all of Norse mythology into his tri-functional model has been rapidly losing support over the past couple of decades. For a good review and critique of this and other theories, see the entry for Gullveigr in Rudolf Simek's "Dictionary of Northern Mythology," pp. 123-24.